BEMIS in partnership with our European partners is developing the VALLEY project (Validation System in Lifelong Learning Experiences of Youth Volunteering). The theme of recognition and validation of learning outcomes from informal or non-formal settings is commonly understood as one of the most important challenges for educational and training sector nowadays. One of the most powerful informal learning contexts is represented by the volunteering sector, where people have the opportunity to experience different situations, putting into practice their own skills and getting new experience. Most of this new knowledge can represent an asset for volunteers in other areas of their life, as for e.g. in professional career. In most cases organisations working with volunteers are not often aware of this ongoing learning process and the wide range of competences that can be developed. It is also true for many volunteer organisations in Europe who also lack the awareness of ongoing learning process and the range of competences that can be developed. NEETs are young people who are ‘Not in in Education, Employment or Training’. They can get benefits from becoming a volunteer and from the validation of the competences acquired in this context, having the opportunity to (re)establish social networks, build social capital, connect to educational and occupational possibilities and to focus again on their own future, embedding a sense of achievement. Volunteering represents an ideal opportunity for helping young migrants to facilitate their integration into their community. It provides the basis for people to make new social connections, share their skills and help people in need, develop community knowledge, increase language skills and acquire new competences potentially valuable in terms of employment opportunities. BEMIS along with its partners carried out a survey questionnaire and desk research on volunteering across the UK in 2015/16. Findings from partner host countries highlighted a lack of recognition for informal and non-formal volunteering. Similar research was carried out in the UK and our findings showed that there are four national volunteering programmes in the UK: Millennium Volunteers in Northern Ireland, vinspired in England, Saltire Award in Scotland and Millennium Volunteers in Wales Each of them works in partnerships with volunteering organisations (delivery partners) in a given region. The Duke of Edinburgh’s Award is a prestigious award aimed at volunteers aged 14–24 and is available at three levels: bronze, silver and gold. The Scottish Youth Achievement Awards which are aimed at young people aged 14+ and provides an opportunity to develop Curriculum for Excellence. However, the VALLEY validation aims at providing a new approach to promote volunteering among young people as a resource of personal empowerment; to validate skills and competences developed during their volunteering experience and how the development of their competences can be evidenced. The organisations are responsible for overseeing the volunteering process. The volunteers are required to keep records of their activities on an e-platform. The project leader approves the records and applies for certificates for them. The information on the certificate itself is rather basic. The Scottish programme of mainstream school education. In this the volunteers go through a peer assessment process, as well as review and award challenge certificates. The certificates for the highest awards are usually signed by Ministers or, as in the case of the Duke of Edinburgh’s Award, a member of the Royal Family, and are handed out during special award ceremonies. The LEVEL5 software is based on a five step process to achieve the set goal and competences. The Competences in this project refers to the level of independence achieved through a high level of self-determination, well-developed abilities for self-regulation and self-direction, awareness regarding one’s own strengths and resources and inspiration to use them autonomously. 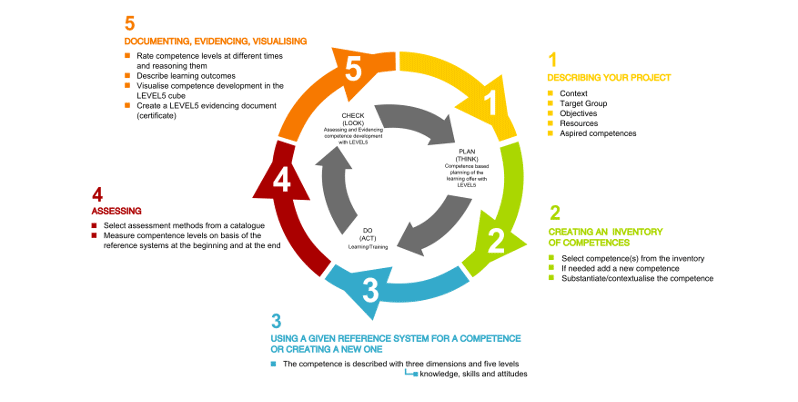 A reference system of the competences has been developed, there are sixteen references of competences to choose from. Each competence is looked at within the sense of initiative and entrepreneurship, learning to learn, based on essential knowledge, skills and attitudes of the volunteer. The volunteer will follow steps based on his/her knowledge in scoping the skills, power and resources. The LEVEL5 process takes the individual through the steps of knowing as he/she is responsible for the decision making process which can affect others and the impact of knowing and its synergies. In addition, acknowledging skills and attitude play a great part when tackling a situation and drawing from both external and internal resources. The LEVEL5 system is initiated from a three dimensional cube: knowledge, skills and attitude from previous projects. 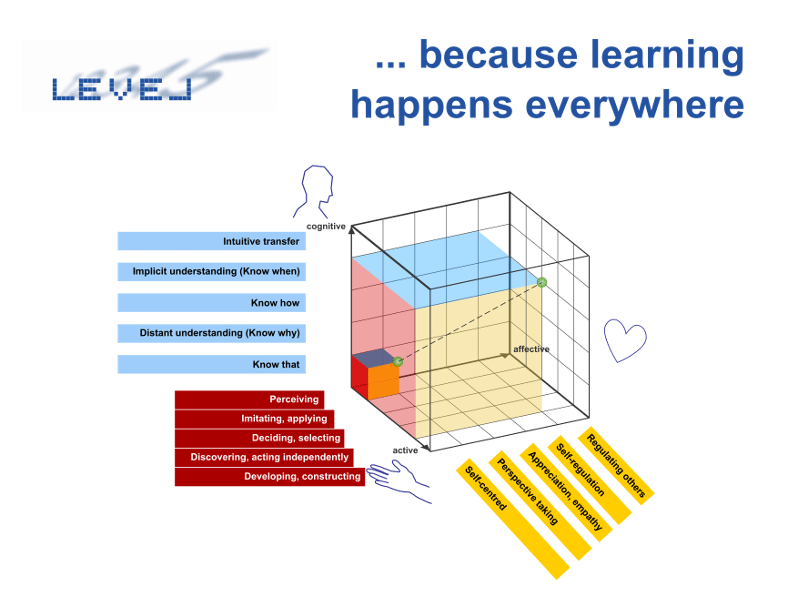 LEVEL5 is built on the achievements of the three dimensional cube which shows the development of specific and defined competences through clear indicators, which contributes to acknowledgement and recognition of the values of non-formal and informal learning opportunities, especially in national/regional context, which tend to give priority to formal education. 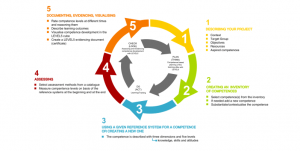 LEVEL5 can become a powerful tool for institutions and decision makers to encourage and attract more volunteers and use the VALLEY Label to generate a two page certificate which highlights areas of competences developed, knowledge gained and attitudes towards learning and cognitive behaviour. What is the VALLEY label? How to get the VALLEY label? Contact the VALLEY team and receive the VALLEY Label. Take the first step and register for the VALLEY Toolbox.